Coordinates: 56°49′8.1″N 45°5′34.6″E﻿ / ﻿56.818917°N 45.092944°E﻿ / 56.818917; 45.092944 Kitezh (Russian: Ки́теж) is a legendary city beneath the waters of Lake Svetloyar in the Voskresensky District of the Nizhny Novgorod Oblast in central Russia. Reference to Kitezh appears for the first time in "Kitezh Chronicle", an anonymous book from the late 18th century, believed to have originated among the Old Believers. Legend has it that Georgy II, Grand Prince of Vladimir in the early 13th century, first built the town of Maly Kitezh (Little Kitezh) on the Volga River (today's Krasny Kholm). It is sometimes erroneously identified with Gorodets, which was actually founded some 30 years before Georgy's birth in 1189. Later on, the prince crossed the rivers of Uzola, Sanda, and Kerzhenets, and found a beautiful spot on the shores of Lake Svetloyar, where he decided to build the town of Bolshoy Kitezh (Big Kitezh). According to folk etymology, the name of the town came from the royal residence of Kideksha (near Suzdal), ransacked by the Mongols in 1237, while Max Vasmer labels the place-name as "obscure". After having conquered some of the Russian lands, Batu Khan heard of Kitezh and ordered his army to advance towards it. The Mongols soon captured Maly Kitezh, forcing Georgy to retreat into the woods towards Bolshoy Kitezh. One of the prisoners told the Mongols about some secret paths to Lake Svetloyar. The army of the Golden Horde followed Georgy and soon reached the walls of the town. To the surprise of the Mongols, the town had no fortifications whatsoever. Its citizens didn't even intend to defend themselves and were engaged in fervent praying, asking God for their salvation. On seeing this, the Mongols rushed to the attack, but then stopped. Suddenly, they saw countless fountains of water bursting from under the ground all around them. The attackers fell back and watched the town submerge into the lake. The last thing they saw was a glaring dome of a cathedral with a cross on top of it. Soon only waves remained. This legend gave birth to numerous incredible rumors, which have survived to this day. It is said that only those who are pure in their heart and soul will find their way to Kitezh (the road to the lake is still called "Батыева тропа", or the Path of Batu). It is also said that in calm weather one can sometimes hear the sound of chiming bells and people singing from under the waters of Lake Svetloyar. Some people[Like whom?] say that the most pious individuals may actually see the lights of religious processions (called "крестный ход") and even buildings on the bottom of the lake. For this reason Lake Svetloyar is sometimes called the "Russian Atlantis". 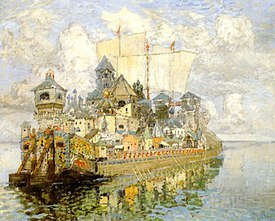 Nikolai Rimsky-Korsakov's opera The Legend of the Invisible City of Kitezh and the Maiden Fevroniya (1907) is based on the legend of Kitezh. The town is also mentioned, among many other references to Russian folklore, in Monday Begins on Saturday, a novel by Boris and Arkady Strugatsky and Charodey film and film script. The acclaimed German filmmaker Werner Herzog went in search of Kitezh in his short documentary Bells from the Deep (1993). Kitezh is the childhood nickname of Tilda Swinton's character Emma Recchi in the film I Am Love (2009, Luca Guadagnino). Kitezh is mentioned in Kraken by China Miéville. "Marge read of their utopias, sunk not in ruination but reward: Kitezh, Atlantis, Tyno Helig." Tunturia's album Invisible City (2012) is an instrumental concept album that follows six stages of the rise and fall of Kitezh. A theme in Anna Akhmatova's poem "The Way of All the Earth" or "Woman of Kitezh" (Kitezhanka or Китежанка). A fictionalized version of Kitezh is rediscovered by the protagonist in the 2015 video game Rise of the Tomb Raider. This page was last edited on 29 January 2019, at 23:16 (UTC).